Welcome to the first SAUHMA Newsletter. 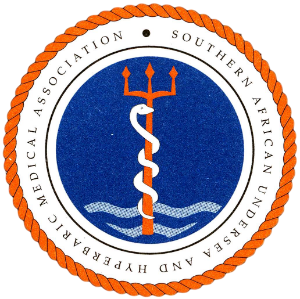 This has been a dream of the Southern African Underwater and Hyperbaric Medical Association Executive Committee and membership for a long time. Due to the actions of Mr Morné Christou and Mr Francois Burman it has at long last become a reality. I would like to extend a sincere word of gratitude to everyone who has made a contribution to this newsletter. Please contact me with suggestions regarding topics of interest that you would like to be discussed in forthcoming issues of this newsletter, or if you have something that you would like to contribute. SAUHMA is a voluntary association recognised as a Special Interest Group by the South African Medical Association. The Association works towards promoting the practice of underwater and hyperbaric medicine, and facilitate the study of all aspects of underwater and hyperbaric medicine. The association is made up of members and associate members: Medical Practitioners; Registered Nurses; Registered Paramedics; Qualified Hyperbaric Chamber Operators; Diving Instructors; Dive Operators, and any other individual, who, to the satisfaction of the Council of the Association, provides evidence that he or she has a special interest in the subject of underwater and/or hyperbaric medicine. SAUHMA has successfully collaborated with the Department of Labour to set up Regulations for Diving Medicine. Once again Dr Meintjes and the Stellenbosch team made a huge contribution to this. Dr Cecilia Roberts arranged and hosted a Diving Medicine Refresher Course in Pinetown in 2015. During this meeting Dr Roberts was elected to succeed myself as President of the Association when my term comes to an end in 2017. Dr Roberts also arranged a Hyperbaric Workshop that was hosted in Stellenbosch in February of this year. During this meeting Dr Roberts presented the National Hyperbaric Oxygen Therapy Protocols, that were presented, modified and accepted at the meeting. A word of gratitude does not do all her hard work any justice. During the Hyperbaric Workshop a National Hyperbaric Registry was proposed and initiated. Dr Frans Cronjé’s contribution to this was invaluable. The process of regulating Hyperbaric Oxygen Therapy was proposed at the SAUHMA National Conference in 2014, but further steps have recently been taken in this regard. A formal meeting was convened with Dr Terence Carter of the Department of Health in May 2016. As a result of this another meeting with all the relevant stakeholders will be convened by the Department of Health during the second half of this year. All of the medical directors of the various hyperbaric facilities will be included, but if you want to be included, please contact me so that we can inform you of when and where the meeting will take place. Hyperbaric oxygen therapy (HBOT) is a well-established, conventional medical treatment. It is not without risks, nor is it invariably beneficial. Appropriate patient selection and medical supervision are therefore critical to ensure its safe, cost-effective and ethical application. The most obvious risks of HBOT are associated with the physical effects of pressurisation and depressurization, an elevated fire hazard, and the potential for explosion of pressure vessels. Patients undergoing HBOT may also suffer several possible medical complications and side-effects1-6. Of these, middle ear barotrauma is the most common: it affects up to 9.2% of patients). Other effects include changes in visual acuity; hypoglycemia, oxygen toxicity, dizziness, anxiety reactions, dyspnoea and chest pain (in 0.5-1.5% of patients); and pulmonary barotrauma-related complications. Several medical conditions represent relative or absolute contra-indications for HBOT (e.g. current pneumothorax and previous Bleomycin therapy), and should be specifically screened for before therapy is initiated. In addition to the physical and medical implications, there are also economic ones. HBOT is relatively costly, which is why its use should be based on sound medical- and scientific justification. HBOT is therefore subject to the same statutory and ethical medical principles that govern other aspects of health care – including medical facilities, -devices and pharmaceuticals. As representative association for the medical application of HBO, SAUHMA considers it a foundational ethical requirement for a medical practitioner (who is trained in the use of HBOT) to (1) select patients for HBOT, and (2) supervise each and every treatment that is provided. By extension, SAUHMA considers unsupervised HBOT treatments to be potentially life-threatening, intrinsically unethical and therefore completely ineligible for reimbursement by either patients or third-party payers. To clarify the role and function of the medical practitioner responsible for HBOT, however, and to clearly define what the scope and nature of medical supervision should look like in practice, SAUHMA has developed a Policy on Medical Supervision for HBOT. This Policy represents the consensus statements formulated at a SAUHMA HBOT Workshop in February 2016. Ongoing HBOT treatments were based on the outcome / progress of the preceding HBOT sessions, with due consideration to the true need / justification for further HBOT, additional testing, and/or for adjunctive medical-, surgical- or wound care. In order to meet these obligations, the responsible Medical Practitioner may delegate duties to another medical practitioner, who is adequately trained, able and willing to perform them. Irrespective of whether or which duties have been delegated, however, immediate advanced life support and emergency medical care must be available at all times during HBOT. Also, notwithstanding any of the above, the responsibility for operating a clinical hyperbaric chamber for patient treatments may not be delegated to any person who is not a current, registered healthcare professional. Physical operation of the chamber may be performed by a person not registered with a health professional council on the condition that the responsible health care professional is able to personally and continuously monitor the health and wellbeing of the patients in the chamber. Monoplace Chamber Operations: The minimum on-site team of staff shall consist of two persons of which at least one is registered with a health professions council. Teams typically consist of a medical practitioner (to supervise the treatment and for emergency assistance - if necessary), and a registered nurse or emergency medical technologist to operate the chamber. Multiplace Chamber Operations: The mimimum on-site team shall consist of (1) two persons who are registered with a health professions council – usually a hyperbaric physician (for supervision of the treatment and for emergency assistance, if necessary) and a medical attendant for taking care of patients inside the chamber (under pressure); and (2) a chamber operator to conduct the hyperbaric treatment from outside; the operator does not need to be a registered healthcare professional. A medical practitioner qualified to provide HBO treatment is one who has undergone specific training in this field of medicine. Current competence in the management of acute cardiopulmonary emergencies relevant to HBOT (e.g., current ATLS training which includes the placement of intercostal drainage sets) is essential. First two modules of the BScMedScHons (Hyperbaric Medicine) programme of the University of Stellenbosch. Other international programmes may be submitted to the SAUHMA Executive Committee to confirm equivalency. Continuing medical education in hyperbaric medicine of a minimum of 16 hours every 4 years after initial credentialing. ​Certain duties may be delegated by the responsible medical practitioner, to medical practitioners who are not trained in hyperbaric medicine, on the proviso that they have (1) received appropriate in-post training at the facility, and (2) have acknowledged their formal, informed acceptance of the delegated duty based, and (3) are competent to do so. Hadanny A, Meir O, Bechor Y, Fishlev G, Bergan J, Efrati S. The safety of hyperbaric oxygen treatment--retrospective analysis in 2,334 patients. Undersea Hyperb Med 2016; 43(2): 113-22. Skeik N, Porten BR, Isaacson E, et al. Hyperbaric oxygen treatment outcome for different indications from a single center. Ann Vasc Surg 2015; 29(2): 206-14. Camporesi EM. Side effects of hyperbaric oxygen therapy. Undersea Hyperb Med 2014; 41(3): 253-7. Seidel R, Carroll C, Thompson D, et al. Risk factors for oxygen toxicity seizures in hyperbaric oxygen therapy: case reports from multiple institutions. Undersea Hyperb Med 2013; 40(6): 515-9. Biddle C. Oxygen: the two-faced elixir of life. AANA J 2008; 76(1): 61-8. Ambiru S, Furuyama N, Aono M, Otsuka H, Suzuki T, Miyazaki M. Analysis of risk factors associated with complications of hyperbaric oxygen therapy. J Crit Care 2008; 23(3): 295-300. ​To reduce bubble size and eliminate gas nuclei. To maximize the diffusion gradient for elimination of inert gas and thereby accelerate gas ‘wash-out’. Hyperoxygenation of hypoxic and/or ischemic tissue. Reduction of oedema. Attenuation of ischemia-reperfusion injury. ​Onset of musculoskeletal pain, cutaneous manifestations, central or peripheral neurological lesions or cardiopulmonary symptoms within 24 hours of completing a dive or series of dives to a depth that exceeds 9 metres sea water. Consider altitude provocation. The ability to differentiate decompression sickness from cerebral arterial gas embolism in the acute treatment phase is no longer considered critical. Diagnosis to be confirmed by a medical practitioner trained in diving medicine. ​Symptom onset within 24 hours of completing a dive that involved moderate to high gas loading. Dives to the limit of or exceeding no decompression time frames. Obvious violation of decompression guidelines. Treatment should not be commenced more than 14 days after exposure. ​Continue administration of 100% oxygen via non-rebreather mask, naso- or endo-tracheal tube for up to 16 hours. Complete dive history, including staged decompression and repetitive diving profiles. Physical examination including, but not limited to, a full neurological examination. Special examinations: Exclude pneumothorax before recompression; chest x-ray mandatory if lung overexpansion is suspected. Other special examinations as required. Signed informed consent for HBOT. Urine output monitoring. Exclude urinary retention; catheterize if necessary. Maintain at least 1-2 mL/kg/hr. Consider oral Tenoxicam or equal NSAID during recompression for musculo-skeletal DCS. DVT prophylaxis critical for paralysed divers. Sedation only if essential. USNTT5 (or equivalent) only for asymptomatic, omitted decompression or pain-only DCS, with complete relief within 10 minutes at 2.8 ATA otherwise treat on USNTT 6. USNTT6 (or equivalent) for all other DCS including neurological or cardiopulmonary manifestations. Consider extensions at 2.8 ATA and/or 1.9 ATA where indicated. In case of CNS oxygen toxicity, interrupt oxygen breathing and allow 15 minutes of air breathing after reaction has entirely subsided. Resume treatment schedule at point of interruption. Major symptoms: Consider 1 – 2 further USNTT6. Minor symptoms: HBO at 2.0-2.4 ATA for 90 minutes daily. Refer patients with residual symptoms for rehabilitation. Risk assessment for return to diving, as indicated. Consider PFO screening where indicated. ​Approximately 75% of cases have complete resolution following the 1st USN TT6. ​T70.3 Caissons disease (decompression sickness). ​T70.8 Other effects of air pressure and water pressure. Blast injury syndrome. ​Level C. All authorities consider it unethical to subject this indication to a randomized controlled trial with a non-treatment control group. Much has been written about, speculated on, and even mandated as to what clothing materials are suitable for use in a hyperbaric chamber. This article provides some of the factual and practical considerations when deciding on what materials to select for regular chamber clothing. All clothing fabrics burn; especially in the presence of elevated concentrations of oxygen. There are also other considerations to take into account, including static-electricity control, comfort, fit, functionality, appearance, soil-resistance, laundering suitability and even control of dedicated clothing within a unit. However, the overriding consideration remains fire safety and this often affects the final decision. Traditionally, and as still evident in many hyperbaric standards and guidelines, cotton has been the material of choice. This is largely based on perceptions that cotton burns slower, does not release especially toxic combustion products, and does not melt onto human skin. However, this is only partially true. In fact the fire-safety record of cotton needs to be reviewed in more detail. The main factors that render cotton more or less burnable are the density of the weave, the thickness of the material, the presence of a fluffy or loose pile, and the individual fit on the person. Being an open-cell or porous material, cotton does not retain oxygen once the environment changes. Lastly, cotton does not promote a build-up of static electricity, rendering it less likely to serve as a source of ignition energy. In comparing like-for-like materials, in terms of weave, thickness and fit, cotton is not highly-rated in terms of time to actually ignite. In addition to cotton, there are two alternative, practical options, viz. (1) a ‘suitable’ blend of cotton and synthetic (polyester) material, and (2) the new generation fire-safe materials – such as a blend of viscose* and natural fibre (an example of which is a fabric made of wool and viscose – used to produce children’s nightwear). * Viscose is a natural polymer made from wood pulp, often referred to as Rayon, and commonly referred to as a semi-synthetic fibre. Reviewing the intrinsic properties of these materials provides additional, relevant information, such as a comparable measure for determining flame resistance, also called the Limiting Oxygen Index or LOI. This measure indicates whether material is appropriate for hyperbaric operating conditions, especially as these indices represent the minimum concentration of oxygen required at the ambient environmental pressure to ignite the materials. Once again, it is the relative scale that is important rather than the absolute values. In essence, the term ‘flame resistance’ – when applied to the use of clothing in hyperbaric facilities – should rather be read as “time to act”; a precious commodity in the event of a chamber fire. The author has three personal recommendations regarding clothing that do not relate specifically to the material of selection, but do having bearing on clothing with respect to fire. It is preferable to select clothing that can be removed relatively easily without having to be pulled over a person’s head. Garments that can be removed easily in the event of a fire will result in less severe burns, or possibly avoid burns completely. It has to be accepted, however, that the various fixtures such as buttons (which tend to get lost) or ties (which tend to result in modesty issues) are not ideal. Pockets should not be installed in any chamber clothing. The added control requirement is one more step that can go wrong and too often pockets may be used to carry contra-band into the chamber; usually completely unwittingly. The more close-fitting the garments, the lower the flame spread rates tend to be; accordingly, this fit of garment is recommended. Interestingly, and as a result of analyzing the Florida fire of 2009, the least burned surfaces of both patients were the areas covered by synthetic undergarments. This tends to support this opinion. So, what about tie-strings versus elasticized waist bands? In theory, loose pieces of clothing will ignite more easily; yet elasticized materials contain especially hazardous synthetic materials. The best path to follow is that of full analysis and selection of materials that are most suitable, e.g., a tight-weave draw-string, or an elastic material with natural rubber and fire-resistant fibre. However, in both cases, as long as these materials are kept away from direct exposure to a source of ignition and are surrounded by other known fire-resistant material, the actual additional risk is not significant. And what about static electricity? This natural phenomenon results in the discharging of 3000V+ electric sparks - sometimes between unsuspecting personnel or patients and any grounded object (like the chamber). Apart from being a source of surprise, it is a possible ignition source. In general, natural fibers (cotton) tend not to produce a significant static charge, whereas polyester-containing materials are more inclined to do so. There is an almost direct relationship between the polyester content and the amount of charge. Therefore, additional controls may be needed where static is a known issue, and these apply to both the inside and the outside of the chamber. These could include grounding straps (which may be wrist, heel or shoes-based); washing with a suitable fabric softener or spraying materials with a 30:1 dilution of water-to-softener; applying a suitable anti-static spray; or using grounding mats located at key places (especially at the entrance to chambers). It is evident that there is no cookie-cutter answer to the best choice of materials to use in a hyperbaric chamber. This short article has simply attempted to highlight the important considerations and to provide a basis for reaching an appropriate decision. The latter should only be taken on the basis of sufficient knowledge of what has been selected, and this decision-making process should be recorded in writing, and maintained with the facility’s documented safety program. No materials are perfect, and none can mitigate general negligence. ASTM D 1230-61: Standard Test Method for Flammability of Apparel Textiles, ASTM International, West Conshohocken, PA, 1994. Australian Government Articles on Clothing Fabrics. Lenzing Fibres Sales and Marketing Library, Germany. NFPA 99: Health Care Facilities, Quincy, MA, 2015. New Zealand Standard 8777: 1973 Men’s Industrial Overalls for General Purposes. Risk Assessment Guide, International Atmo, Inc. San Antonio, Texas, 2015. U.S. Consumer Product Safety Commission, Flammable Fabrics Act. ​During August 2015, SAUHMA hosted their 11th biennial conference at the Premier Hotel in Pinetown. This took the format of a diving medicine refresher, focussing on the level 2 designated medical practitioner (DMP) responsibilities and Occupational Health in the workplace. The refresher also included an in depth look at neuropsychological, neurological and psychiatric fitness in divers, for the Level 1 DMP. We had 27 delegates attending Level 2 and 46 attending the Level 1 refreshers, with lectures by local as well as two international guest speakers. Dr Jurg Wendling, a hand surgeon from Switzerland, vice-president of the European Diving Technology Committee (EDTC) and member of the European Committee on Hyperbaric Medicine (ECHM) was one of the visiting lecturers. He is well known for leading the task group that compiles the Medical Assessment of Working Divers handbook published by the EDTC, which is currently under review. He is a very keen diver himself, well experienced in telemedicine and mandates as diving medical advisor for professional diving operations which include saturation and compressed air diving (tunnelling). Jurg is also a regional director for DAN Europe. He discussed the level 2 DMP’s role in medical advisory support for inland saturation diving by means of his personal experience; addressed the principles of telemedicine for recreational and professional diving with the focus on treating DCI in remote areas; and elaborated on the difficult task of assessing neurological and psychiatric fitness for diving together with the impact of psychoactive drug use. Finally, he gave us an insight into the European view of diving medicine standards and training in order to facilitate international exchange while assuring competence, possibly resulting in a general international consensus in nearby future. The second international speaker was Professor Simon Mitchell, an anaesthesiologist and diving and hyperbaric physician based in Auckland, New Zealand. He is an avid diver who previously held the world record for the deepest dive to a shipwreck (183 metres on AHS CENTAUR off Brisbane, Australia). He was the 2010 recipient of the Albert R Behnke Award; the highest award made by the Undersea and Hyperbaric Medical Society (USA) for contributions to diving science; and received the DAN / Rolex Diver of the Year Award in 2015. This well published academic and editor of numerous baromedical and physiology peer-review journals is a truly excellent presenter. He 'finned off' by discussing the bubble vs gas content model decompression algorithm controversy and outlined the current state of evidence which has begun to cast serious doubt on whether the bubble model approach is optimal or superior to a gas content model approach. Since “technical diving” and “rebreathers” are subjects that diving doctors are increasingly expected to be familiar with, the challenges and particular the hazards of these activities were also discussed in an attempt to equip our doctors with enough knowledge to facilitate a clinical conversation with a technical diver. Deep diving imposes a number of significant challenges to respiratory homeostasis, which can include respiration of dense gas, external resistance in underwater breathing apparatus, static lung loads, and rebreathing of CO2 (in rebreather diving) and which can limit ventilation performance and disturb its control. These perturbations of respiratory physiology are of substantial practical relevance, particularly in deep diving safety. The relevant physiological mechanisms were explained, and recent insights into the mitigation of respiratory problems through modification of diving practice or diver selection were discussed. A recent DAN study appears to suggest that 27% of recreational diver fatalities include a myocardial event as the disabling injury. The inevitable conclusion is that current systems for recreational diver selection and health surveillance are failing to detect and adequately manage prospective or established divers with coronary artery disease. This issue was the subject of a consensus discussion at the DAN Fatality Workshop in 2010, and the findings were published in 2011. The presentation on cardiovascular screening for diving fitness conferred the suggestions for diver screening that arose out of that workshop as well as the recent publication of a joint statement by SPUMS and the UKSDMC on the controversial subject of screening divers for patent foramen ovale. Following an interesting debate, we established a SAUHMA task group to help formulate an updated guideline on cardiovascular fitness screening. In previous years, the traditional “prescriptive” approach to determination of suitability for diving was a relatively simple process. The doctor would elicit the candidate’s medical problems, consult a list of contraindications to diving, and exclude candidates who had problems appearing on that list. Over the last two decades, and in recreational diving in particular, a “discretionary approach” to such determinations has evolved. In the modern day fitness-to-dive perspective, the doctor’s role is to elicit the candidates medical problems, evaluate the risk they truly represent, educate the diver about this risk, and thereby facilitate a risk vs benefit evaluation by the diver as an informed risk acceptor. It is undeniably true that the diving medicine world has become less prescriptive and more discretionary over the years, but there remains great variability between practitioners on where they sit on the continuum between these philosophies. Both the prescriptive and discretionary systems advantages and disadvantages were discussed and a structured approach to the evaluation of virtually any medical problem in the context of diving was conveyed. Dr Jack Meintjes, an occupational medicine specialist and Medical Director of Divers Alert Network Southern Africa (DANSA) serves as our designated SAUHMA Occupational Medicine consultant and Education & Collaboration consultant. He presented the concept of a Hazard Identification and the process of Risk Assessment to the participants by means of practical examples on how these are to be assessed. A particular emphasis was placed on the duties and responsibilities of the Level 2 DMP and the interaction with occupational health personnel. To help attendees apply these skills, they all participated in performing a HIRA in group format, followed by a facilitated feedback session the following day. He furthermore discussed the current guidelines for recompression therapy, supported by a practical approach highlighting critical decision-points. Asthma and diving fitness remains a discussion point at international conferences and has recently expanded to include queries regarding fitness for commercial divers with asthma. A few cases had previously been discussed by the SAUHMA diving medical fitness panel, but clear guidelines do not exist. He therefore provided an overview of international perspectives on this topic, with a proposed practical approach to the asthmatic diver. Lastly, Dr Meintjes gave some feedback on the SAUHMA diving medical fitness registry, a requirement in terms of the Diving Regulations 2009. Dr Frans Cronje is a colleague who truly needs no introduction. As the founder, past medical director and current board member of DANSA – a not-for-profit company dedicated to the assistance and safety of recreational divers, he is also considered the pioneer of modern hyperbaric oxygen therapy in Southern Africa and an excellent lecturer. With his vast experience and interest in ENT issues, especially in diving fitness, he was well equipped to emphasize some specific areas of concern that may be underestimated to assist non-ENT specialist DMP's to identify and establish practical management options for divers with ENT problems. Noise-induced Hearing Loss (NIHL) represents a significant, often underestimated and largely unaddressed occupational medical and legal risk in diving operations. He therefore provided a review on the salient physiological, medical and legal issues, as well as the challenges relevant to addressing this matter in the diving environment. Many individuals above the age of 40 are on some form of chronic medication, divers included. Even those who are not taking prescription medication may be using recreational drugs or other social stimulants or tranquilizers (e.g., caffeine, nicotine or alcohol). Dr Cronje presented an approach by which the use of any drugs or medication may be assessed within a greater diving safety framework. Lastly, he reminded us that “all that tingles is not the bends” by delineating more clearly those presentations of DCI which constitute a valid indication for recompression from the symptomatology, and which do not. In the current context that we live in, psychological issues are very real in every day RSA. Dr Charles van Wijk, psychologist at the Institute for Maritime Medicine, who has a great passion for psychological fitness in diving, discussed some of the current issues associated with HIV Associated Neurocognitive Disorder (HAND) and presented various ways of screening for HAND, concluding with data from a recent South African study. He also facilitated a discussion on pertinent issues in screening for psychological fitness for diving. Dr Blanche Andrews, is one of the DANSA diving medical officers and currently a registrar in Occupational Medicine at Stellenbosch University. She reviewed the context of a diving medical consultation by exploring the relevant roles, responsibilities and legislative framework that apply. Finally, Miss Elana Human, an occupational therapist practising in Cape Town and with a special interest in the injured worker and returning to work matters, presented on Functional Capacity Evaluation (FCE). This provided better understanding of FCE, selecting appropriate candidates for referral, and how this might assist the physician in making decisions about disability, restrictions and return to work of injured workers. She has recently embarked on a new project to develop a job specific FCE tool for commercial divers. A decision was made to add the portfolio of Occupational Therapist to the SAUHMA committee for which Ms Human was elected. Certain lecture recordings are available on the SAUHMA webpage (www.sauhma.org) under the video section. But ​what will a Diving Medicine Refresher be without some diving? We just had to showcase our beautiful coastline to our visitors so a few members embarked on some epic diving early the Saturday morning which was the perfect way to start a day. All successful participants will receive accreditation and will be included in SAUHMA’s Register of Certified Hyperbaric Health Care Professionals. ​The St Augustine’s Hyperbaric Medicine and Wound Care Centre at St Augustine’s Hospital (SAHMWCC), Durban is the only hyperbaric medicine facility of its type on the east coast of southern Africa. As such, it is the referral centre for most diving-related accidents over an extended coastline. This facility was established in November 2000 and, over the past 16 years, has successfully assisted a great number of injured divers. The chamber is a South African-built multi-place chamber, certified to take 10 adults seated in the main lock and 2 adults seated in the entry lock. The chamber has a walk-in door into the main lock, allowing patients to either walk into the chamber or allowing the passage of a wheelchair or hospital bed into the chamber. This easy access is further facilitated by the sunken level of the chamber – there is just a small step from the unit floor to that of the chamber. A “traditional” round door separates the main lock from the entry lock – this is rarely used by patients, being used rather for the at-pressure transfer of medical or technical staff. Although the usual working pressure of the chamber is either 2.4 or 2.8 ATA, the chamber is certified to a pressure of 6 ATA. Patients undergoing hyperbaric oxygen therapy (HBO) breathe 100% oxygen, delivered either by a hood and neck-seal system or by an aviator-type mask. The patients are accommodated either in a seated or supine position, depending on their clinical status or the indication for their treatment. Communication between the chamber occupants and the chamber operator is provided by a number of systems. Verbal communication is achieved by an “open” microphone in the chamber, as well as a sound-powered phone used by the attendant. The operator can also visually monitor the occupants, via the closed-circuit television camera or directly through the chamber port-holes. The unit is ideally situated with easy access to the St Augustine’s Hospital level one trauma unit and intensive care units, as well as having direct off-road access. With this in mind, the chamber is equipped to treat ventilated “ICU status” patients and we have quite some experience in treating general medical emergencies as well as some extremely ill divers. A practical point in this regard is that at the SAHMWCC we first assess injured divers in the hospital’s trauma unit. This facilitates the resuscitation and initial investigation of the patient in the most appropriate environment. Once we have decided that recompression therapy is warranted, we move the diver to our unit (2 floors by lift!) and continue with the treatment. Since commencing operations, this unit has completed over 6300 patient treatments. The majority of the patients treated at this unit have suffered from various acute or chronic medical conditions for which HBO is indicated, including thermal burns, crush injuries of the limbs, life-threatening anaerobic infections, chronic bone infections, bone and soft tissue injuries following radiation therapy and certain non-healing foot ulcers. In addition, we have treated numerous cases of decompression sickness, including a wide variety of clinical presentations. Our patients have ranged from divers who have simply omitted a safety stop, to severely ill divers with cerebral or spinal decompression sickness. We have treated cases from the Transkei coast to as far north as Tanzania, and we have treated divers injured out at sea as well as those diving in local quarries. The chamber was certified as being compliant with the requirements of the Recompression Chamber Assistance Partner Programme (RCAPP). This process involves regular servicing and maintenance of the various technical components of the chamber, ensuring medical and patient care standards are maintained and providing for the health and safety needs of our staff. Re-certification was achieved in 2011 and is again due this year. both doctors are trained in underwater and hyperbaric medicine; in addition they have years of experience in the fields of trauma, surgery and musculo-skeletal medicine; they have run the SAHMWCC since its inception and have years of experience in treating dive-related problems. Mrs Purchase is a highly trained paramedic with a number of years of emergency medicine experience; she is trained as a chamber attendant and operator. In addition we make use of a number of ‘locum’ technical staff – these people are predominantly paramedics who have successfully completed courses as chamber attendants and operators. As is common for hyperbaric medicine centres, the SAHMWCC has developed an active wound care facility that provides advanced wound management for a variety of chronic non-healing wounds. These wounds include venous stasis ulcers, diabetic foot ulcers, pressure ulcers, poor healing surgical wounds, burn wounds, etc. All of our staff participate in this side of our practice. In addition, the SAHMWCC is quite involved in education. The medical directors not infrequently lecture to various medical and lay groups about diving accidents and their management. They also provide practical tuition on advanced wound care in the unit. The SAHMWCC is also used for training chamber attendants and operators. Successful students receive an internationally accepted certificate of competence that enables them to work in this field locally and abroad. We also allow divers the opportunity of having supervised dives in our chamber. Called “jolly dives”, these dry dives allow divers to experience nitrogen narcosis and the effects of the pressure-volume changes at depth in a controlled environment. These dives also teach the local diving community about their nearest recompression facility and what to do should they need our assistance in an emergency.